The City of Zion adheres to the Statutes set forth by the State of Illinois Attorney General’s Office as it pertains to the Illinois Freedom of Information Act (FOIA), 5 ILCS 140/1. The Act allows for the inspection of records maintained by the City of Zion and other public bodies. The Act also provides for exemptions of certain secure information. Amendments to the Act are incorporated into the City’s implementation of the Illinois FOIA. 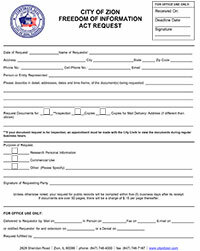 All requests to inspect, copy, or certify public records must be submitted to the City Clerk in writing and in the appropriate form ( personal delivery, mail, fax, email, or other means available ). The City will respond to each written request to inspect or copy public records within five (5) business days after it is received, unless an extension of time is determined necessary. The first business day is the day after the City received the FOIA request. The City will respond to a written request made for commercial purposes within twenty one (21) days after it is received. Applicable fees for copies of public records must be paid prior to receiving the requested documents. There is no fee for up to the first 50 pages of standard paper copies. For more than 50 pages, there is a $0.15 charge per page. Larger than standard paper size copies are charged at the City’s reproduction cost. Copies will be provided in the medium requested by the requestor whenever possible. 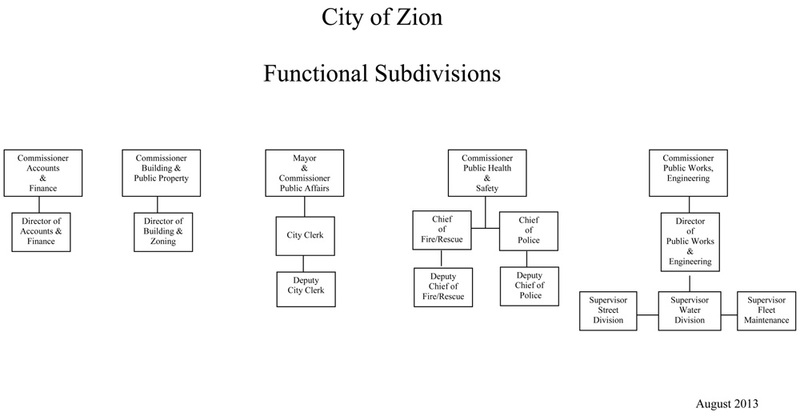 The City of Zion is a municipality incorporated and organized under the laws of the State of Illinois for the purpose of providing its residents with police protection, fire protection, ambulance/rescue service, sewer and water service, garbage and recycling collection service and street and sidewalk repair/maintenance. Zion Police Department 2101 Salem Blvd. Northeast Lake County Consolidated ETSB (with Gurnee) – Chief Steve Dumyahn, Chief John Lewis, and BC Eric Troy. Firemen’s Pension Board – Al Town, Mike Stried, John Lewis, David Knabel and Sarai Soto. TIF Review Board – Margie Taylor, Chris Szymanski, Bill Warren, Juanita Winfrey, David Miller, Marilyn Krieger, Audrey Liddle.